Microsoft Security Essentials is a free tool that was made to individuals as well as small businesses. It was built in the same as powerful security programs like MS Forefront, Windows Defender, and Malicious Software Removal Tool. When Microsoft Security Essentials is installed on the computer, it runs silently in the background. Users will only get alerts if malware is identified. The tool will prompt user to take specific actions for identified threats. Microsoft Security Essentials can also perform default actions as specified in its settings. It can quarantine or delete detected threats automatically if you configured it to do so. This security program regularly updates the database and is scheduled to run scans on a timely basis. Microsoft Security Essentials works well with almost every PC that is running on Windows XP, Windows Vista, and Windows 7. How to Download, Install, and Scan with Microsoft Security Essentials? 1. Download Microsoft Security Essentials from the link below. Save the file on your hard drive. 2. Once the download completes, double-click on the file MSEINSTALL.EXE to install the program. 3. On Microsoft Security Essentials welcome screen, please click Next to proceed. 4. 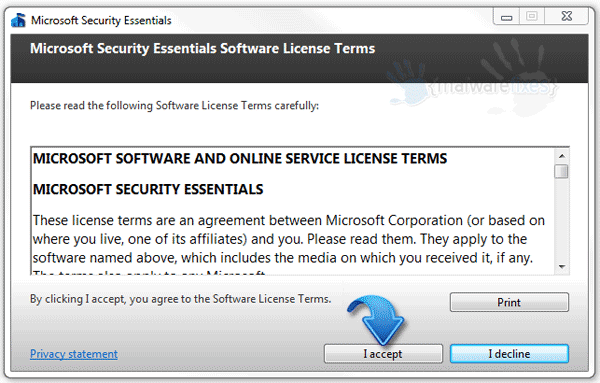 You need to accept the License Terms in order to continue with the installation. 5. Just proceed with the steps. It may prompt you to remove any installed antivirus programs. Microsoft Security Essentials may work alongside some antivirus program so if you wish to continue without uninstalling, please click Install. 6. At the end of the installation process, the program is set to scan the computer. Click Finish to start the scan. 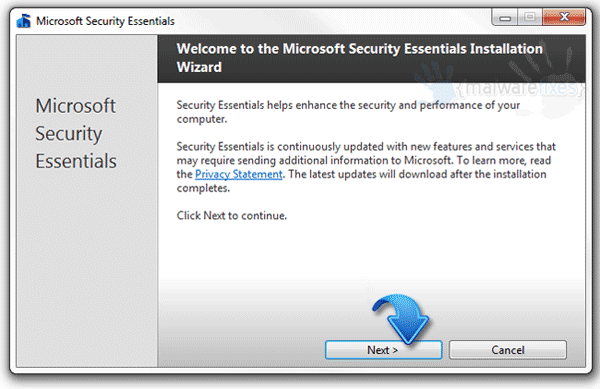 Expect that Microsoft Security Essentials will download updates for first time installation. Please wait for the update to finish. 7. The program scans the computer after downloading and installing necessary updates. Let the scan to end. Delete or quarantine identified threats and close Microsoft Security Essentials. Please restart Windows to finalize the scan.